So this past weekend I went down town shopping and found some great stuff! My most exciting buy was two jean jackets for ten bucks!! How that happens? I don’t know ,but I am so pumped about it! I am not really a jean jacket kind of girl but for five bucks a piece I am now!! 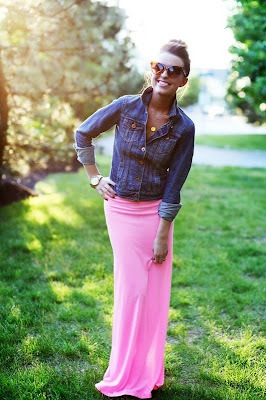 Here are a couple super cute ideas that I found on Pinterest on how to wear jean jackets!! Also today I will be getting my hair done!! The sad thing is I still don’t know what I want! This is what I narrowed it down to! Maybe I will get a mix of all three!! My stylist Daniela is great so I am sure she will do a wonderful job!! Remember to link up today and if you’re interested on how I styled my jean jacket check out my instagram KikiTarin. I’ll post a pic once I’m all ready!! Cute pins, allll of them! All the fashion pins are great. I may have to try one or two! Adorable round-up! Love a good jean jacket for spring, the perfect topper. Love your pins! And those jean jackets are stunning!! LOVE all of these pins...I can't believe that jean jackets are back in style. My favorite is to pair it with a fun maxi skirt. Can't wait to see what you did to your hair! That is such a great deal! Those pins make me excited to wear my jean jacket! I can't wait to see how your hair comes out. I'm sure it's going to be fabulous! Jean jackets are my favorite! i like this post!